In the past 17 Presidential terms , nine were GOP led and eight Democratic. Of nine GOP Presidents, six added to debt/GDP and deficit/GDP as a percent. The only three that did not, had a Democratic House and Senate. Of eight Democrats, each one, reduced deficit/GDP and debt/GDP as a percent. The president who added a historical 20.7% to the debt has one unique aspect of his presidency – President G. W. Bush had a GOP majority House and Senate. The national debt has gone up more than $200 billion a year under Republican presidents and less than $100 billion a year under Democrats. From 1978-2011 debt went up 4.2% under Democrats versus 36.4% under the GOP. Under Republican presidents since 1960, the federal deficit has averaged $131 billion a year. Under Democrats, that figure is $30 billion. In an average Republican year, the deficit has grown by $36 billion. In the average Democratic year it has shrunk by $25 billion. Since 1978-2011, spending has gone up 9.9% under Democrats versus 12.1% under GOP. From 1960 to 2005 the gross domestic product measured in year-2000 dollars rose an average of $165 billion a year under Republican presidents and $212 billion a year under Democrats. Federal spending has increased $35 billion a year under Democratic presidents and $60 billion under Republicans. Democratic presidents averaged 3.13% on inflation compared with 3.89 percent for Republicans. Democratic presidents averaged 5.33% unemployment versus 6.38 percent for Republicans. Unemployment went down in the average Democratic year, up in the average Republican one. No Democratic state has over an 18% poverty rate – six GOP states do. No Democratic state has over 17% of its population living "food insecure." Four conservative states do. No Democratic state has over 20% of population living without health insurance but four GOP states do. The average monthly return on the stock market has been 0.73% under Democrat presidents, almost double the 0.38% under Republicans. The S&P 500 is up some 74% since Obama took office. From 1948-2005, income growth rates under Democratic presidents for the 95th, 80th, 60th, 40th and 20th percentiles were, respectively, 2.1%, 2.4%, 2.5%, 2.5% and 2.6%. Compared to Republicans' 1.9%, 1.4%, 1.1%, 0.8%, and 0.4%. During 20 years of Republican administrations, each year on average the number of Americans living below the poverty line rose by 416,400, while during 20 years of Democratic administrations. While Bush was in office, the median household income declined, poverty increased, childhood poverty increased even more, and the number of Americans without health insurance increased. The country's condition improved on each of those measures during Bill Clinton's two terms. 3 million jobs were created under the Bush administration. 23 million under Clinton. But, of course, this is all just made up, miscalculated and taken out of context. 29-year old male in Bangor, Washington, United States. You've heard of the difference between correlation and causation, right? It came to be at its height. It was commanded to command. It was a capital before its first stone was laid. It was a monument to the spirit of man. Isn't that the thing that says when one piece of data correlates with another it's unlikely it's to be the cause, but when it happens about fourty times, it probably has a causal link? That chestnut? No, that's what statisticians who don't pay attention to it say. It's the thing that says correlating one piece of data with another is simply not how one goes about establishing causation. It doesn't matter how many "times it happens," it's not enough qualitatively. You use controlled experiments for that, because that way you're ruling out getting the causation backwards and a third thing causing both phenomena and samples contaminating each other and such. Lol, I saw that coming. Laissez faire is a lot like a religion. It's adherents will make endless excuses to defend it. What I see is that Libertarians are very smart people because they understand theory. But that's it. Theories are dangerous things because they over-assure people of their rightness. Any theory seems fool proof to it's adherents as long as it's consistent. But that doesn't mean a thing. There is no real world basis for laissex faire economics. There IS a basis for Capitalism. Capitalism works. That's what the facts shows. Business increases human welfare. But the facts also show that there ARE things the government can do to improve it and encourage it. I see that Libertarians are highly romantic. They feel strongly that they need to defend the idea of less government intervention. Because government always = bad. But that's preposterous. The real world doesn't work like that. There are no purist theories that do well at explaining whole systems. The world is full of complexities and the solutions we want for solving our chosen issues are always going to be a complex, changing and seemingly inconsistent, relative to purist dogma. Keep in mind that this isn't an argument for why the are wrong. I'm not ad homming here. But I wanted to communicate my perspective of Libertarian fundamentalists being misguided. I think they need to seriously take a step back and question themselves for once. Because it's a huge barrier to rational discussion about economics. .....Your facts do not discredit anybody. At best, they put a dent into Republicans, who are very very very very far away from laissez faire until somebody calls it a cause-causality fallacy. Can you provide real world evidence that, on average and across the field, laissex faire economics does better than progressive economics? It helps to have a sample size before trying to prove something. Capitalism did cause the prosperity. But lack of proper adjustments also led to extreme market volatility. The boom and bust cycle. Historically, we can see that there are many more, and much longer, recessionary periods when the economy lacks a central bank to increase liquidity during bad times and increase stability in good times to prevent or reduce the hazard of bad times in the future. The banking regulations that were put in place following the great depression were instrumental in stabilizing the economy. You can see that recessions were shorter and spaced longer apart following the New Deal. What's bad about the boom and bust cycle? If only the central bank didn't cause many of these recessionary periods in the first place. I'm sure you know how the Great Depression was caused by the Fed, right? I have this odd and arbitrary position that mass unemployment, decreased economic output, increased poverty and suffering are unpreferable things. Central banks can be run incorrectly. It doesn't refute my point. How exactly do you reverse causality along different points on a timeline? The New Deal happened. THEN there was a period of high economic stability. There are lots of valid arguments you could make. Not that one. Is that a consensus among economists our something you pulled from your preferred fringe group of economists? The Great Depression was caused by a combination of factors. It involved improper action by the Federal Reserve, but more importantly by the entire rest of the banking system which created over-liquity, which lead to over-investment compared to the path of the rate of consumption, leading to a boom built up by massive bubbles that were bound to burst and eventually did. There were other issues, including Britain's return to the gold standard. With no proper social safety net in place, the vast majority of the market had nothing left to fall back on which created extreme stagnation, which is a problem not only for the working class but the business class who depended on their consumption. Layoffs followed, increasing the problem further. The only thing that could immediately fix that problem was heavy amounts of government spending to get people back to work and on payrolls. There was some spending at first, but it was never enough until we entered World War II. This created economic movement where there wouldn't have been otherwise, which allowed the market to get back up on it's own feet and take over afterwards. In the past 17 Presidential terms , nine were GOP led and eight Democratic. From the get go this is fallacious. Congress establishes economic policy through statutory law, the president gives executive orders on how to carry out the congressional policies. The President may be able to veto legislation, but his veto can be overturned by a 2/3 vote from both houses. Banking is the short circuit of the free-market. It breeds massive amount irrational exuberance when gone unchecked. Firstly, that doesn't make it fallacious. Secondly, the overturning of a veto scarcely ever happens. In general, the congress only has influence that the president approves. The president, however, has many powers that do not need to be approved by congress. Any expert in law would accept that the president has more power than congress and any economist would accept that they play a defining part in the economy based on their actions. So if there are dynamic, diverse, and ever-changing problems, why should we employ one of the most sluggish institutions, government, to attempt to solve the problems? What if when governments try to solve problems they consistently make the problems worse? I'm always open to the possibility that I'm wrong. That's why I gravitated to positions that are the most defensible from the evidence. What do you think governments do that could not be provided better through voluntary interaction? There are many studies that provide empirical evidence for the Austrian Business Cycle Theory, which finds expansionary monetary policy to be the initial cause of the boom-and-bust cycle. Furthermore, if you look at depressions in which a laissez-faire recovery was permitted, they are relatively short (e.g. the 1920-21 Depression); conversely, when a full array of government fiscal, monetary, make-work, regulatory, board-creating, and interventionist policies are pursued we see that Depressions last incredibly longer (e.g. the Great Depression). More economic controls =/= prosperity. In fact, several of the banking controls lead to riskier banks because the customers' deposits are ensured by the government, and dispersed among the tax-payers. This, on net, destroys wealth. The New Deal is broken into two parts: First New Deal (1933–1934) and the Second New Deal (1935–1938). 14 years after the start of the First New Deal programs, 1947, the economy returned to pre-1929 levels of private sector growth, investment, etc. Banks are held liable under contracts and property rights. They are held to these contracts to hold their investor's money and when they withdraw it, have a legal obligation to return the money that the investor originally put in. See, what we have is not adhering to Laissez-Faire economics. Loan guarantees threw much of the risk involved away, which allowed the Sub prime mortgages to have triple A ratings, messing up the banking system. Then the sub prime mortgages became muddled with other obligations such as student loans, etc (CDO's). Since real estate values were skyrocketing due to 1) easy money via the Fed, 2) the regulations to make bankers sell more real estate where people were less likely to be able to afford it (Community Reinvestment Act of 1977), and 3) the loan guarantees and the easy housing due to variable rate mortgages. With low rates (the rates were variable) it attracted many people to buy houses, values increased and people took out equity on their homes. This led to a growing economy (to a degree of course), esp. during the Bush years (2003-2006). When variable rate mortgages had higher rates, people began defaulting, lowering home values, and making money tighter to access. This led to a slowing economy. The Fed increased the money supply, but the core of the bubble (housing) wasn't repaired, because home values were lower, so the recession happened. If banks were held liable via contracts and property rights, they would be rational about the risks and really aware of them. The Great Recession used loan guarantees to mess up this idea. Powerful you have become, the dark side i sense in you. Secondly, the overturning of a veto scarcely ever happens. The congress still has the power to overturn the President's veto. If congress fails to gain enough votes to overturn the veto, it is no different than if they failed to pass the initial bill; the issue is that congress failed to agree, not that that the president disproved. In general, the congress only has influence that the president approves. Does that mean the President determines what bills are proposed? No! Once again, congress can still overturn the veto; unless the President's signature is absolutely required, you cannot claim he is responsible. The President also has to compromise with congress; he may hate the bill, but like the general concept, and if congress does not pass the bill he wants he has to sign the closest thing to it. The president, however, has many powers that do not need to be approved by congress. Any expert in law would accept that the president has more power than congress and any economist would accept that they play a defining part in the economy based on their actions. The President's authority is limited by law; he cannot act without congressional approval. The President only has the power to make executive decisions regarding how to carry out the policies made by congress. The President can't go to war without congressional approval, he can't levy taxes, he can't draw money from the treasury, and he can't establish new government programs without congressional consent. There is no scientific basis for anything in economics or any other field of human action. You realize regulations started growing massively long before the Depression right? There's this thing called the "Progressive Era." let's face it...the president is just a faceman. Do you think the democratic Congress would have acted any different under Hillary? Can't wait for the Republicans to start saying "Oh...well....congress and the presidency don't have that much control over the economy and budget. But we'll still vilify Obama for those things like the brainless fvcktards we are..."
because the public is stupid. What if the facts blatantly show otherwise? I'm always open to the possibility that I'm wrong. That's why I gravitated to positions that are the most defensible from the evidence. Can you present this evidence? What do you think governments do that could not be provided better through voluntary interaction? The market cannot reallocate bountiful funds from an entire sectors of the economy to another, automatically take action to manufacture new mass liquidity, hold back on liquidity to stabilize itself, establish certain services as universal or regulate itself in areas where irrational exuberance or other chaotic risk factors are over-abundant. A central banking system and a social safety net are absolutely crucial to the prolonged stability of a Capitalist economy. This is what the test of time has told. Mismanagement of a central bank can play a large part in economic downturns, but they are very far from the whole story. The primary issue here is liquidity; how freely money is moving around; essentially the very essence of what a thriving economy is. But it's an accepted fact of economics that when liquidity is too high, parts of the economy will grow too fast for their own good and create bubbles where more money has been invested than the path of the rate of consumption of that thing is going to meet. Although the Federal Reserve has control of the initial interest rate that it lends out to other banks, it has absolutely no control over the interest rates that those other banks give to everyone else. So the entire rest of the banking system obviously plays a larger role in the direction of the economy than the central bank itself. Observe any economic material you can on the The Free Banking Era in America from 1837-1862. It was disarray. Economists know it and the people who lived at the time knew and experienced it. There were hundreds of different banks all throughout the country with different bank notes. They failed constantly. Their average lifespan was only 5 fives. Their bills were often worthless. That causes a lot of immobility for an economy. The Great Depression lasted 4 years which not an irregular amount of time for depressions of it's caliber. We've had several that lasted longer, including two that occurred within the The Free Banking Era and another that came close. No, you see I'm not the one defending that line of thinking. The Libertarian notion is the one that more economic controls are always bad. My position is not so puritan. I recognize that there are some instances where it is needed, which depends highly on context. 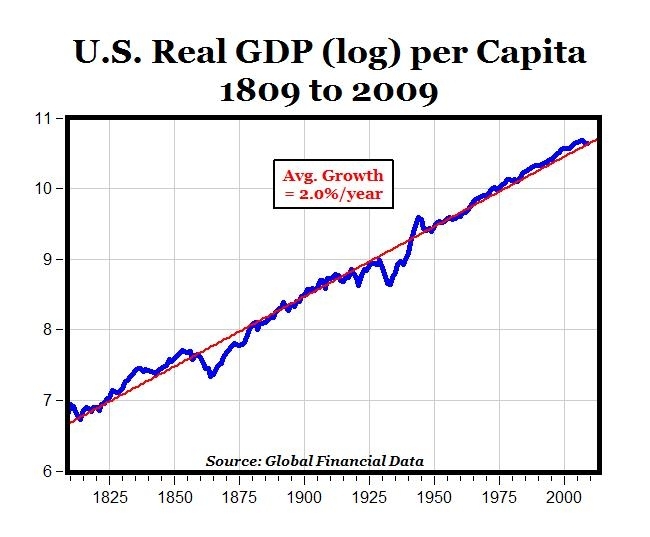 Here's the GDP per capita over the years. You can see clearly that the angle of recovery after The New Deal was of increased sharpness and continued on well above normal levels. Hell, if we continued on that same incline, I'd be living on a Mars station and be typing with my mind. By the way, see that dip that was even bigger than the Great Depression? That happened in The Free Banking Era. We didn't come out of it until we established a new banking system.